I have to admit, this was a bit of a fortuitous phone call. I was traveling when I received a phone call from Lynn Barnett, a retired gutter installer and inventor from Ohio. He was calling to tell me about his new invention that replaces splash guards on roof valleys. See splash guards are great for keeping water from spilling over at the base of a valley, but terrible for allowing leaves and debris to fall to the ground. What invariably happens is that leaves, sticks and other matter work its way down the valley and lodge behind the splash guard. This creates a damming effect, and before you know it, you have to climb your ladder to clean the debris out from behind the splash guard. If you don’t clean this area, leaves and debris will build-up onto the roof surface, clog gutters, and water will eventually overflow around the splash guards. It’s a mess, a nuisance, and contributes to wood rot and foundation damage. The choice until now has been to keep the splash guards in place and occasionally clean this area or remove the splash guards, which will allow leaves and debris to flow off the roof surface, but allow water to do the same, especially if you have gutter guards in place. Since this area of the roof acts more like a river due to the convergence of two roof surfaces, the water flows down the valley at a high rate of speed. This has been a classic problem for most gutter guard manufacturers. Whether your gutter guards are made from a solid material — such as aluminum or plastic — or screen, the water flow rate can be more intense than the gutter guards allow. 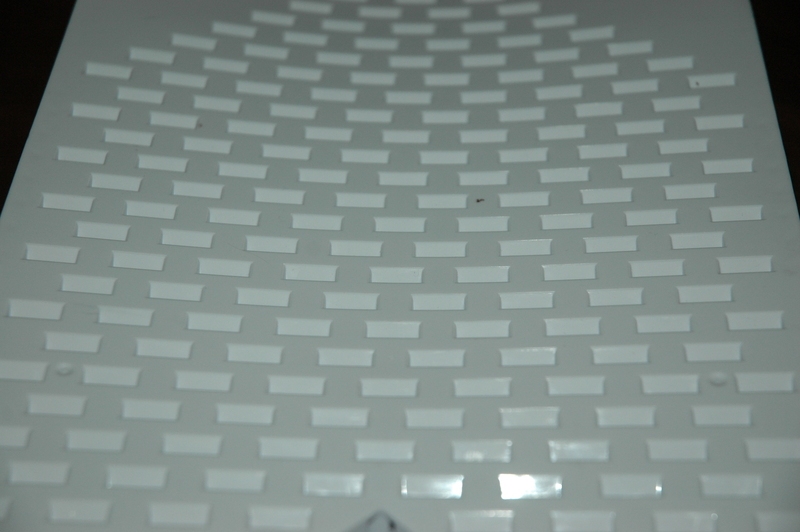 We’ve always given our clients the option of keeping or removing the splash guards. Sure, there are things we can do to slow the water down if we remove splash guards, but it requires customization that is time consuming and difficult to consistently implement. Nobody has ever come up with a better solution to solve this problem, until now. As it turns out, the inventor and I were both in the same town on the day of his phone call. He was visiting potential distributors throughout the southeast and I was visiting prospective clients. We agreed to meet in a Shoney’s parking lot, and when I showed up, he was sitting on the back of his camper trailer awaiting my arrival. He had set-up his sample display and I asked him to give me his sales pitch. It didn’t take me more than 30-seconds to see how this product was going to make homeowners across the land happier. It was one of those “a ha” moments when you think to yourself, “Why didn’t I think of that.” And, believe me, I have thought plenty about how to solve this problem! So has Lynn Barnett. For Lynn, this was the culmination of being in the guttering industry for 31-years. His design, which he has been working on for five years, is slowly making it’s way onto wholesale distributor’s store shelves and may make an appearance in a gutter near you soon. 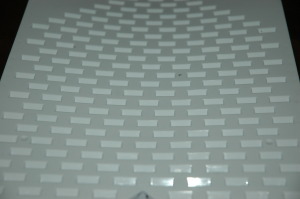 It incorporates a patented cheese-grater style top and louvered sidewall design. Water flows through the open slots into the gutter, and debris washes over the top of the surface and falls to the ground. It’s made of Kostrate®, the same material as plastic water bottles. The plastic is pliable, will stand up to sub-zero temperatures, and has a memory so that it can take and hold a shape. 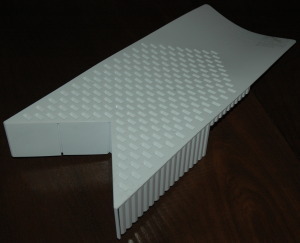 It will fit on any asphalt shingle roof with or without a metal valley, and secures under the second course of shingles. It’s guaranteed for 12-years, and can be painted with any acrylic paint to match your roof and gutters. I liked the product so much, I said that I wanted to make it available directly to homeowners online. Here’s your chance to get a headstart and take care of this problem once and for all. If you have gutter guards on your home or are contemplating putting them on, this system will work with any style gutter guard. It’ll actually make your gutter guard system work better since it solves one of the most nagging issues for homeowners — excess water flow in valleys. To watch a video on how the system works, go to http://bit.ly/aXSiF3. Next story It is Time for a Better Mousetrap!